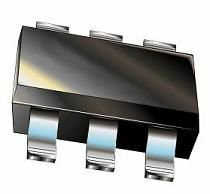 The LMH7220 is a high speed, low power comparator with an operating supply voltage range of 2.7V to 12V. The LMH7220 has a differential, LVDS output, driving 325 mV into a 100 symmetrical transmission line. The LMH7220 has a 2.9 ns propagation delay and 0.6 ns rise and fall times while the supply current is only 6.8 mA at 5V (load current excluded). The LMH7220 inputs have a voltage range that extends 200 mV below ground, allowing ground sensing applications. The LMH7220 is available in both the 6-Pin TSOT and SC-70 packages. These packages are ideal where space is a critical item.